College of the Environment faculty, staff and students use countless ways to broaden the reach and impact of their work. We rounded up a few examples that illustrate the breadth, innovation and creativity that come with different kinds of science communication and outreach. Enjoy and explore the highlights from a year of great science communication. The Public Comment Project seeks to promote evidence-based policy by facilitating scientists’ engagement in public comment on federal regulations. University of Washington graduate students spearheaded the project from a shared belief that scientists across disciplines, career stages and sectors must advocate for the use of science in public policy. They developed a user-friendly portal that allows researchers to find and weigh in on regulations seeking public comment. Check out the Public Comment Project’s website and contribute. 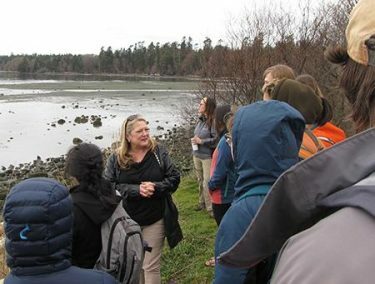 Friday Harbor Labs director Billie Swalla speaks with class at San Juan Island’s False Bay. Shorelines and waterways mean different things to different people. In their interdisciplinary field writing course — Ecopoetics Along Shorelines — the School of Marine and Environmental Affairs’ Cleo Woelfle-Erskine and July Hazard explore shoreline histories and ecologies with their students in the Pacific Northwest. A major goal of the class is to bring together a diverse set of students who share and learn from one another, recognizing that the humanities, social and natural sciences view issues through different lenses that challenge and complement each other. Read more about the ecopoetics course on the College of Arts and Sciences website. There’s no limit to the ways you can share your passion for science, as School of Oceanography graduate student Sasha Seroy shows. She has an affinity for invertebrates — marine, freshwater and terrestrial — and shares what makes them so fascinating in her comic, “Interviews with Invertebrates.” She publishes a fresh comic weekly, pulling the reader in through clever drawings that uncover unique aspects of these animals. Oceanography professor William Wilcock makes sure his students’ work sees life beyond the classroom. He partners with Wiki Education to bring ocean science to broader audiences. In his Marine Geology and Geophysics class, students explore the dynamic processes responsible for the formation, evolution and destruction of ocean plates. Each student or team of students contributes a new topic or edits an existing Wikipedia page. Students not only sharpen their writing skills but also make their work available to the wider world. Check out the spring 2018 entries. Instructors interested in working with Wiki Education can learn more on their website, or contact William for more information. This spring, faculty and research staff from the College of the Environment dove into improv with an eye towards improving science communication. Course leaders Dave Bogan and Alex Grindeland, from ComedySportz Seattle, and Aquatic and Fishery Sciences professor Tim Essington wanted to get scientists out of their heads to better engage with other people. Over three classes, participants focused on embracing mistakes and unexpected situations, thinking on their feet, being in the moment, and communicating to engage, connect and be understood. In fall 2018, grad students can sign up for a version of this course. Interested students should watch for the opportunity to apply in September under C Env 590. 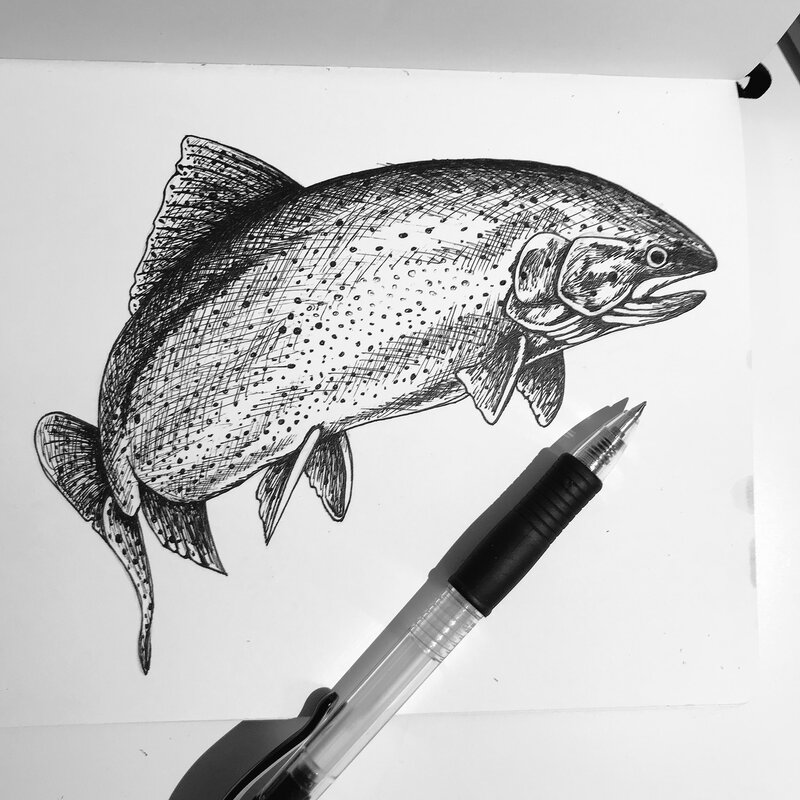 Spencer Showalter recently chose to draw a rainbow trout, Washington’s state fish, for #SundayFishSketch. If you log into Twitter on a Sunday and search for #SundayFishSketch, you’ll find a plethora of illustrations of fishes and other marine species. The hashtag’s creator and conversation starter Rene Martin, a Ph.D. student at the University of Kansas, receives submissions by scientists, artists and anyone else inspired to create — from Seattle to Scotland. 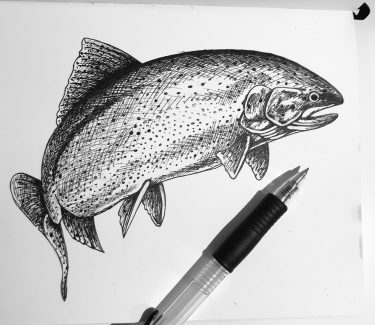 The College is well-represented by Spencer Showalter, a regular #SundayFishSketch contributor and graduate student in the School of Marine and Environmental Affairs. Showalter studies the presence of algal neurotoxins in Alaska’s pink salmon. Read the College of the Environment’s story about #SundayFishSketch. Developed and run by School of Marine and Environmental Affairs students, Currents shares timely, relevant discussions of pressing environmental issues, focused on marine and coastal systems and interactions between humans and nature. The students’ goal is to inform, inspire and incite dialogue on topics that affect society and the natural world. Currents places value on making science accessible to the broader public, providing a diversity of perspectives, recognizing the complex nature of these issues, and challenging both contributors and readers to expand their perspectives. Check out what Currents writers have to say.